Come to Downtown LA for the best Porsche selection! My name is Jay and I am a Los Angeles based Visibility Expert. I help my clients create and manage their on-line visibility and reputation. 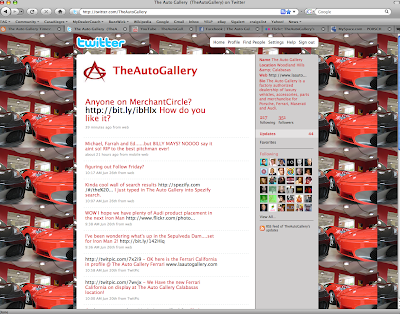 Can You Sell Cars Using Social Media? With a bit of trial and error I was able to prove that you can indeed sell cars using social media sites like mySpace, Facebook and Twitter. LOS ANGELES, CA, June 1, 2009 – The hottest name in racing games and the world’s most progressive maker of sporty luxury cars announced they have forged a partnership centering on the highly-anticipated debuts of the 2010 Audi R8 5.2 FSI quattro and Xbox 360’s “Forza Motorsport 3” later this year. I'm going to NADA in SF! Say hi if you see me. I am thrilled to see that you have joined our community... Welcome and THANK YOU! I am looking forward to any best practices, guidance, tactics, files, photos and videos you are willing to share with us. Also, you have full access to your very own blog web site within this community, so feel free to get into the swing of things and use this community as a means of sharing with associates, clients and friends!